A defunct, uncontrolled Chinese space laboratory disintegrated under intense heat as it re-entered the Earth's atmosphere on Monday and its debris caused ‘no harm’ as it plunged to a watery grave in the South Pacific, Chinese officials said. The eight-tonne Tiangong-1 was mostly burnt up when it entered the Earth’s atmosphere in the central region of the South Pacific at around 8.15 am Beijing time, China's Manned Space Engineering Office said. Tiangong-1 -- or 'Heavenly Palace' -- was placed in orbit in September 2011, acting as a testing ground for China's efforts to build its own space station by 2022, but ceased functioning in 2016. "According to my information currently there is no sign that the re-entry has caused any harm to the ground," China's Foreign Ministry spokesman, Geng Shuang told reporters in Beijing on Monday. "Most of the parts burnt up and disappeared," Geng said adding that China kept the United Nations space agency informed about the situation. Quoting CMSEO, the spokesman said that Tiangong-1 re-entered earth atmosphere on Monday morning. "The location was the central part of the southern pacific and most part of the Tiangong-1 was burnt up on the re-entry." Earlier, Chinese space officials had promised that the disintegration of the 10.4-meter-long spacelab, upon re-entry into the Earth's atmosphere would offer a ‘splendid’ show akin to a meteor shower. But the remote location likely deprived stargazers of the spectacle. According to experts, generally, thrusters are fired on such a large space lab to control and drive them towards a remote zone over the Southern Ocean, but it appeared that such a facility was not available with it after the loss of command links. Tiangong-1 was launched on September 29, 2011 and its service ended in March 2016. It has docked with Shenzhou-8, Shenzhou-9 and Shenzhou-10 spacecraft, and undertaken a series of tasks, making important contributions to China’s manned space cause. Six astronauts, four men and two women, spent time in the lab. The module, which was used to practise complicated manual and automatic docking techniques, was originally intended to be used for just two years, but ended up serving for considerably longer period of four-and-a-half years. The spacelab had hosted Chinese astronauts on several occasions when they performed experiments and even taught a class that was broadcast into schools across the country. 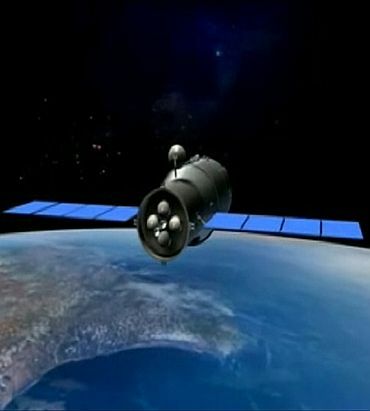 "Tiangong-1 will go down in China's space history. It helped us accumulate precious knowledge for work on the space station," said Huang Weifen, deputy chief designer at the Astronaut Centre of China. Tiangong-1 was part of China's endevour to build its own space station to counter the current Russia's international space station Mir. In 2003, China became the third country to launch humans into space, following the former Soviet Union and the United States. China sent another space lab, Tiangong-2, into orbit in September 2016.